The sprouts, or young seedlings, of the alfalfa plant are associated with several potential health benefits. Although adult alfalfa plants are too coarse and bitter to eat, alfalfa sprouts are tender and appropriate for use in salads, sandwiches and soups. When used appropriately and in moderation, alfalfa sprouts can be a healthy component of a balanced diet. Consult your health care provider before eating alfalfa sprouts on an ongoing or excessive basis, particularly if you have a medical condition or take medication. According to NutritionData, a service of Self magazine, alfalfa sprouts are a good source of dietary fiber. Each 33-gram serving of alfalfa sprouts provides one gram of fiber, or three percent of an average adult's necessary intake. For this reason, alfalfa sprouts may be a suitable food for people suffering from chronic constipation, diverticulitis or other digestive upsets. Every serving of alfalfa sprouts provides 1 gram of plant-based protein, according to NutritionData. 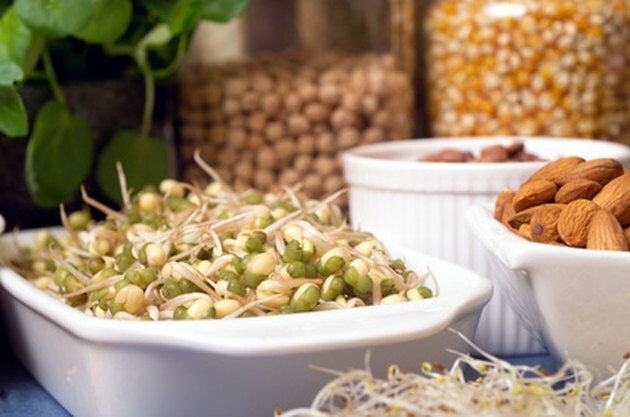 Unlike most other vegan protein sources, such as beans and peas, alfalfa sprouts are edible and palatable without any exposure to heat. Alfalfa sprouts are a good protein source for people eating raw and vegan diets. Alfalfa sprouts are a good source of several micronutrients, or vitamins. NutritionData reports that alfalfa sprouts contain B vitamins such as niacin, thiamin, riboflavin, folate, pantothenic acid and vitamin B6. Additionally, alfalfa sprouts provide roughly 13 percent of an adult's recommended daily intake of vitamin K. Because of alfalfa's high vitamin K content, the National Institutes of Health advise patients taking blood-thinners to avoid foods and supplements made from the plant. Alfalfa sprouts contain only 8 calories per serving, making this crunchy food an ideal choice for people who are trying to lose weight. Self magazine grants alfalfa sprout a five-star rating as a weight loss aid, noting that it is low in calories, sugar, fat and saturated fat. Additionally, because alfalfa sprouts are rich in fiber and protein, they may help to facilitate sensations of fullness for people who tend to overeat. According to the National Institutes of Health, compounds in alfalfa may help to prevent atherosclerosis, a serious cardiovascular disease associated with cholesterol plaque in the arteries of the heart. The NIH acknowledges limited scientific evidence of this health benefit, but notes that no large-scale human studies have conclusively demonstrated its effects. Additionally, the NIH reports that alfalfa can reduce both total and LDL, or "bad," cholesterol. Consult your health care provider before using alfalfa sprouts to treat any medical condition. The NIH regards alfalfa as a possible but unproven treatment for diabetes. The NIH reports small reductions in blood sugar in animals who eat alfalfa. Although evidence is limited, alfalfa sprouts may be a healthy food for controlling blood sugar fluctuations in people with diabetes. According to NutritionData, alfalfa is associated with no glycemic load and will not increase a person's blood sugar. What are the Benefits of an Alfalfa Dietary Supplement? Can You Eat Too Much Natto?